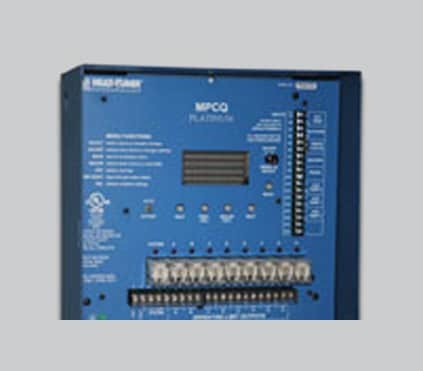 A Multi-Stage Output Sequencing Control for Hydronic, Steam, or Motorized Valve Applications Based on Outdoor Reset or a Set Point. The SQ-Elite comes in many models. 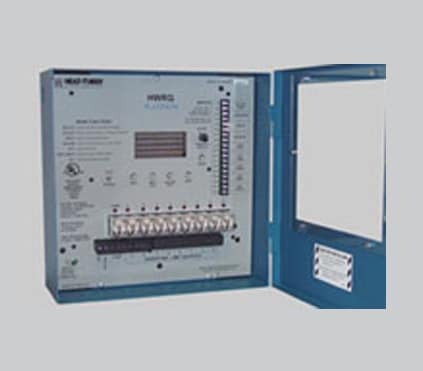 It’s available as an eight-stage hydronic or steam sequencing control. A new model provides six-stage hydronic sequencing in addition to motorized valve control. It incorporates many additional features and fl exibilities that can be customized to each application’s unique characteristics. Hydronic Heating using Outdoor Reset or Set Point. 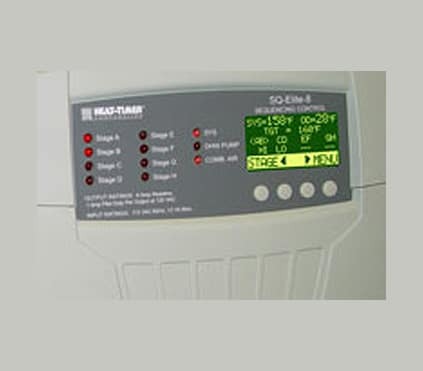 The SQ-Elite-8T control is designed to sequence multiple stages. When in heating mode, it can operate based on Outdoor Reset or a Set Point. Each of the options has a set of pre-confi gured, but adjustable settings to meet the precise needs of each heating application. When in cooling, multiple options are available including, having either one or multiple stages on per unit. Multiple Rotation Options. The SQ-Elite can rotate the lead output to promote even wear. It has three rotation options; Timed Rotation that is adjustable from one hour to 40 Days, Manual rotation, and First-On/First-Off. Adding Stages. The SQ-Elite controls up to eight outputs. However, it can be connected to up to two additional SQExtension panels, each with eight stages, increasing the number of controlled stages to 24. PID or Over-Sized-System (OSS) Sequencing. The normal sequencing offers an advanced PID logic to provide an efficient and adjustable sequencing that can fit most heating and cooling applications whether the outputs are to sequence normally, Lo/Hi/Lo/Hi, or in parallel, Lo/Lo/Hi/Hi. With numerous adjustable parameters like Last Stage Hold, Reaction Time, and Minimum Run Time to eliminate short cycling. The PID logic can be adjusted to meet your specifi c application. OSS has been designed to satisfy applications where fast response is required to match the load, as with process applications. Day and Night Schedule. The control has an adjustable Night Setback setting to help reduce fuel consumption. The built-in schedule can be used to customize the operation for even further temperature control and fuel savings. Domestic Hot Water. With the use of a dry contact DHW input or a DHW sensor, which can be purchased separetly, the SQ-Elite can be confi gured to add Domestic Hot Water Pump Control. It offers a variety of DHW priority options. Minimum Boiler Return. When purchased separately, an optional return sensor can be connected to offer better management of return temperature to reduce boiler condensation and thermal shock. Communicate with EMS (Energy Management Systems). The SQ-Elite with its built-in Shutdown and Prove inputs, is capable of connecting to EMS. Moreover, using the 4-20mA EMS Interface, when purchased separately, the SQ-Elite can accept a set point as a 4-20mA signal from an EMS system. The SQ-Elite-8T comes complete with two temperature sensors.